Locating unique wedding gowns will take some time, so make sure to start your searching as early as 9 – 12 months before your wedding. Below are my top 4 places to start looking for the a unique designed wedding dress. 1. Pick up the latest bridal magazine. Go to your local bookstore. For a unique gown design look through the popular bridal magazines, such as Brides magazine. I like The Knot because it has lots of pictures of bridal gowns by well known and 'little known' designers. At the bookstore check out the specialty bridal magazines which feature more of the "lesser known" wedding gown designers and those that are abroad. They usually have very creative designs. You have to go to the big book stores, such as Barnes and Noble, to find these magazines. 2. Use search tools on wedding websites. oncewed.com It's a great source for wedding dress pictures. 3.Pinterest- The best wedding dress picture source ever! Another source that will help you is to use Pinterest. This is a social media site that's all about sharing images by placing them on boards. One thing I've noticed is that a lot of brides are using this site to share pictures of wedding dresses that they find while searching . You may find your unique wedding gown on a board created by another bride. I am using it to share photos of gowns I find. Check out my unique wedding dresses board. 4. Consider department store bridal gowns. There are other places you can look for unique wedding gowns. Have you seen the gowns by department store designers? 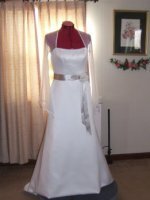 Some of them have unique wedding dress designs at affordable prices. Most department stores like Macy's and Bloomingdales.com only sell their gowns online. You cannot find wedding gowns in the department stores. 5. Consider a custom made bridal dress. 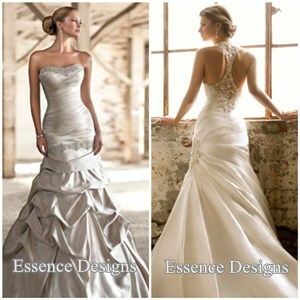 In some cases you will need to consider having a wedding dressmaker design a custom wedding dress for you. In this case you would need to contact a dressmaker with your ideas 1 year in advance.. Your sewing professional will need the wedding dress pictures you collected from the web or the bridal magazines, to get an idea of what you want. So if you need a custom designed gown, determine what your wedding dress design will be early so you can get started on it far in advance of your wedding day. Here are a few wedding dress designers I feel have collections that show a good number of unique bridal gown styles in their lines. I am not affiliated with any of these designers. I listed them for your convenience. The above designers are just a few of my favorites But they will get you started. You will no doubt come across others as you look for the unique wedding gown that's right for you.